"Almost, Maine" was directed by Victoria Barfield at Seminole State College. 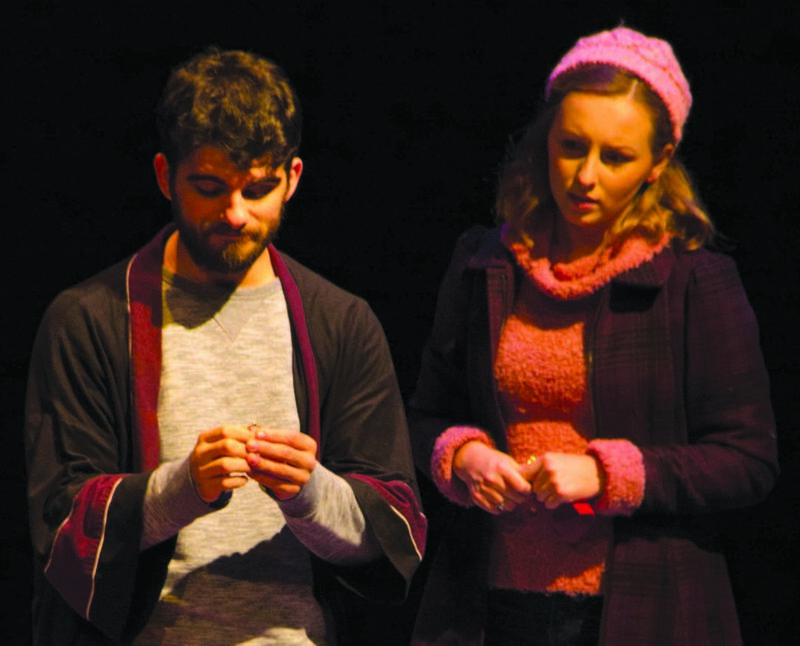 The “Almost, Maine” theater production at Seminole State College received positive feedback from its audience and the crew gave advice to students interested in the arts. The play written by John Cariani ran Sept. 29 to Oct. 8. The setting of the play takes place in the fictional northeastern town of Almost in the State of Maine. Director and Seminole State alumnus Victoria Barfield described how they wanted to capture the isolation of being in Maine. The town is located way from the busy city, ocean and mountains. The play is about “strangers, loved-ones and strangers-alike” and “moments of change and the human connection,” Barfield said. “Almost, Maine” wasn’t just a series of unique love stories and interactions. It also featured humor. At the second night performance on Sept. 30, many people in the audience laughed and gave a satisfying applause with every scene. The Seminole Scribe spoke to actors Alyssa Wilson and Joe Kolasa during the last week of their rehearsals leading up to opening night. Wilson plays two characters named Glory and Marci. She mentioned relating well to the character Glory whose personality was described as quirky and awkward. Character Marci’s relationship in the play had some not-so-loving scenes and although Wilson said she couldn’t relate as much to this character, she did understand why Marci would get so frustrated at times with being stuck in a routine. Wilson performed in the previous fall musical and plans to make acting her career. Her advice to others is that if you’re interested in something just go for it. She added that in acting there are lots of people who don’t get the roles they want, but “don’t be afraid to try” and keep going, she said. Kolasa also played two characters, Lendell and Phil. Lendell is described as a person who is sleepy and seems to never know what’s going on. Kolasa once performed in the production “Almost, Maine” at Lyman High School. He been acting for many years and has directed performances for the annual Orlando Fringe Festival. He is a business partner with Badger Productions, he said. His advice to others was that there is “no better time to try than to go to the next audition.” He also recommended trying other roles aside from acting such as directing and being part of the production team. Director Barfield graduated from Seminole State, then studied on campus for three years followed by more education at the University of Central Florida. She has taken many classes including Theatre Survey, Script Analysis, Acting, and has helped make props. Barfield helped direct for state Thespian competitions. This is the first campus performance she has directed, but she plans on doing more directing in her future. When asked what advice she would give students who love the arts, her immediate response was “education first.” She also mentioned taking risks because otherwise people will not improve. That is what theatre has always been about, she suggested. The actors at Seminole State also served as their own runners due to the small number of cast members. Victoria thought it would be a good opportunity for the actors to become better involved with the production. Costumes for the show were civilian clothing, she said. One actress provided several of her own costumes for the cast and they pulled items from past plays and garage sale hunting.